The National Home Composting Framework, now available exclusively from Straight ltd, has been established by the Waste Improvement Network (WIN), which is delivered by Improvement and Efficiency South East (IESE). WIN has worked with ESPO (Eastern Shires Purchasing Organisation), WRAP, the Better Tomorrows community interest organisation and local authorities to procure the national framework. Straight ltd has been appointed as the sole supplier for all of the products and services available. This EU compliant contract is designed to replace the WRAP home composting scheme which ended in England at the end of September 2009. Councils in Wales, Scotland and Northern Ireland are also able to take advantage of the framework if they wish. What is available through the framework? In pallet quantities or in full loads. Where residents can order directly from Straight ltd. The retail scheme involves minimal management on the part of the council. We are offering a complete solution including promotion, order processing, home delivery and after sales support. This works in a very similar way to the previous WRAP campaign. What is the benefit of the framework? The key benefit of this framework is that there is no need for councils to go to tender if they wish to sign up. This saves time and money for both customer and supplier. The range of competitive prices have already been agreed through an extensive tendering process and are up to 30% less than the most recent prices charged by WRAP in England. Who can buy through the framework? Any local authority in England, Scotland, Wales or Northern Ireland can take advantage of either the bulk prices or the agreed prices for the retail scheme. There is no need for councils to tender for the supply of goods. Please see our Product Guidefor more details. All compost bins are available for bulk supply. Core products and optional products as well as all of the accessories are available on the retail schemes. How much do the compost bins cost? 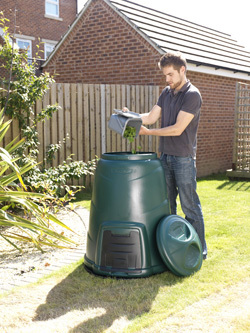 Retail compost bins start at just £16.00. A full price list is available on request. For bulk supplies please contact Charlie Bartfield Tel: 0113 386 8623 E-mail: [email protected] Or you can also contact ESPO – contract reference 860. For retail schemes please contact Jonathan Adler Tel: 0113 386 8655 E-mail: [email protected] You can get a price list from WIN. You will need a password to access the WIN website. This is available directly from WIN. WRAP will continue to provide assistance with communications and information. WRAP will also maintain support and assistance through its Waste Reduction Advisors, helpline, website and publicity materials. The promotional material used will use the Recycle Now iconography (licensed to Straight ltd) and customer lists will periodically be forwarded to WRAP so that residents can receive ongoing monitoring and support. What is involved in setting up a retail campaign? We will send you two forms to complete, one about the choice of products and the other about the choice of promotional options. Send these back to us, we will confirm your requirements back to you and that is it. We will send you a form to complete. Once received, it will take 1-2 weeks to get your campaign live. How long do I need to sign up for? The current campaign runs until 31st March 2012 when prices will be reviewed. The contract runs for four years in total with the option to sign up each year for the next year. If you are not happy at any stage in any one year, the scheme can be cancelled with 60 days notice. A level of promotional support including artwork for adverts and some PR is included in the basic price of the goods. Further promotion including leaflets and doordrops is also available at a modest cost. We will provide a scale of charges and we will prepare a detailed quotation for exactly what you want to do. Can I have The Clangers? Yes, the Clangers can be used to promote your campaign at no extra cost. We will put a Clanger on all promotional material and on your web page. We will also donate 10p from the sale of each compost bin to Yorkshire Cancer Research funding national research into beating cancer. What about one day sales? These are available – details on request. What about garden centre programmes? We are happy to discuss such a programme with you. Can the compost bins be subsidised? Yes – our systems will handle this assuming you have the subsidy available. What sort of reporting is available? A monthly detailed sales report is provided as part of the standard agreement. For more information please contact us or log onto the WIN website. *These local authorities are working directly with Straight ltd rather than under The National Home Composting Framework.